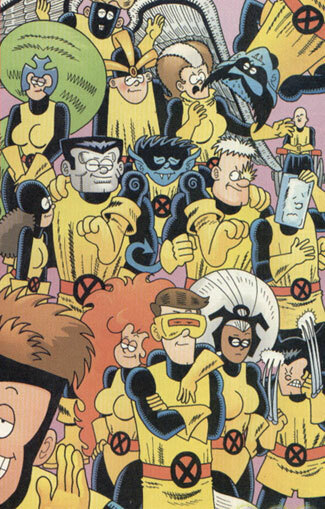 History: (X-Men Millennial Visions 2001- "X-Men: The Retro Men") - As old trends came back into fashion, the X-Men decided to hop on the bandwagon by renaming themselves the Retro Men and going back to their old trend of wearing identical uniforms. Some other team members who were not identified by name were identified by me by recognizing their Earth-616 counterparts. The ones not mentioned by name are: Angel, Colossus, Cyclops, Jean Grey, Havok, Nightcrawler, Polaris, Rogue, and Shadowcat. 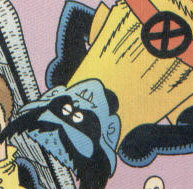 Beast appeared to be mostly the same as his Earth-616 counterpart, aside from the change in costume. 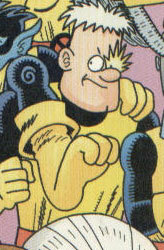 --X-Men Millennial Visions 2001 - "X-Men: The Retro Men"
Aside from the new uniform, Cable did not appear to be any different from his Earth-616 counterpart. Gambit did not seem much different from his Earth-616 counterpart, aside from his wearing of an old X-Men uniform. Iceman was ridiculously overdressed, wearing a classic X-Men uniform over his already iced-over body. Other than that, he was mostly the same as his Earth-616 counterpart. While she agreed to wear an X-Men uniform, Storm did not stop wearing her headdress. Other than that, she was the same as her Earth-616 counterpart. Wolverine was basically the same as his Earth-616 counterpart, with the exception that he always wore an X-Men uniform. Xavier was the same as his Earth-616 counterpart, except for the X-Men uniform that he wore.